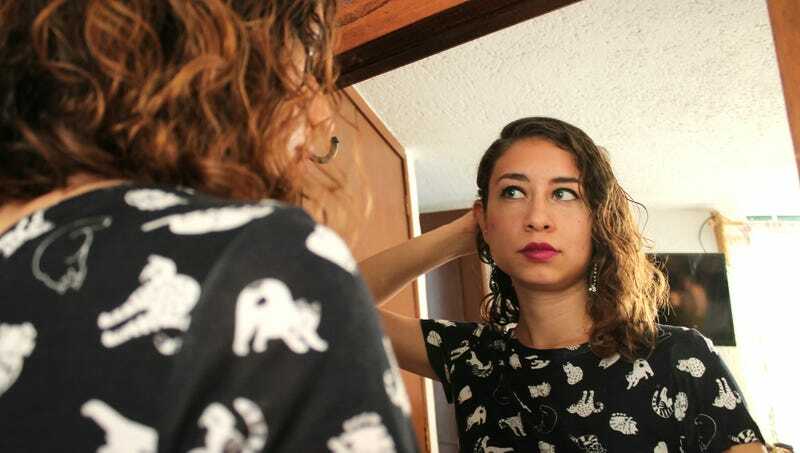 EAU CLAIRE, WI—Speeding through affirmations about her looks, area woman Cara Waller attempted Tuesday to cram a few years’ worth of body positivity into the 20 minutes she had before trying on bathing suits. “Listen up, girl, we don’t have a lot of time here, but just remember every body is a beach body and your value as a person isn’t tied to what size you wear,” said Waller, 28, furiously scribbling “Beauty is a feeling” onto a Post-it note and sticking it to her bathroom mirror before taking a full 45 seconds to list things she liked about her appearance. “I should have been focusing on radical self-acceptance all along, but for now, I’m just going to repeat some body-positive mantras while I look for a new swimsuit. Happiness isn’t size-specific! I’m more than just a number on a scale! I love me and that’s all that matters! Hopefully that will tide me over until I’m done shopping.” At press time, Waller had resigned herself to a black one-piece with a matching sarong.